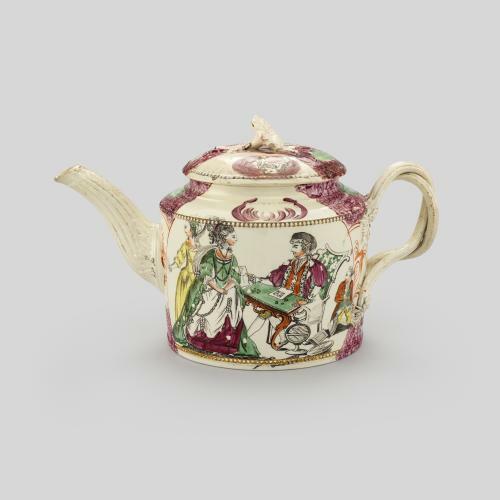 The teawares in this assembled group were made by two of the most renowned British ceramics manufacturers of the 19th century. The smaller, cobalt blue teapot and the cup and saucer were made by Wedgwood, while the cube-shaped turquoise teapot was made by Royal Worcester. The factories of Wedgwood and Worcester were founded in the 1750s, producing both domestic wares and ornamental pieces for a British clientele who were eager to display newfound wealth and taste. Both factories played an important role in the development of the ceramics industry and experimented with new glazes, forms and decoration. Each piece is embellished with dragons, phoenix and prunus blossom, demonstrating the lasting influence of East-Asian design on English ceramics in the 19th century. The turquoise Worcester pot in this set has a tin-glaze, a form of decoration that became fashionable in the Victoria era, as the effect was similar to 15th century Spanish and Italian majolica wares that were being rediscovered by Victorian museums and collectors. 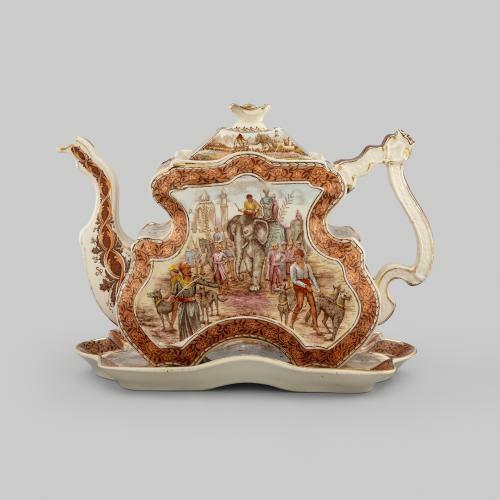 The model for this teapot was designed by James Hadley, one of the factory’s most renowned designers, and was most likely very fashionable at the time, as a similar example can be seen in James Tissot’s painting ‘Holyday’ (ca.1876), in Tate Britain (N04413).